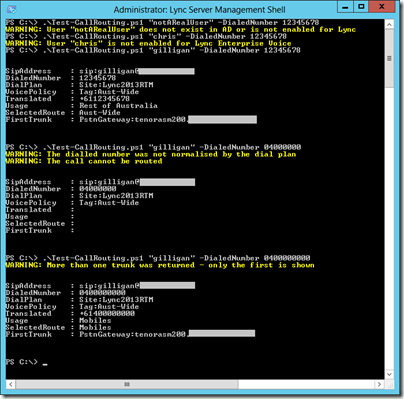 Lync’s Roles-Based Access Control (RBAC) is great fun. It lets you fairly precisely define the rights of a user: you can easily grant or restrict access to specific commandlets, or apply scoping so that a commandlet can be run, but only against a subset of objects (like say a specific site). I’m quite used to playing God in my deployments & never having to worry about such restrictions – until now. I’ve recently found however that deploying a country into a global pool where my own access is subject to RBAC isn’t anywhere near as much fun. I’ve been running into all sorts of invisible walls as my usual open-slather access simply isn’t there. I understand and appreciate why this is necessary, and I don’t want you to think that I’m having a whinge – it’s presented as a bit of a backgrounder for you, and an intro for what’s to come. One feature I *NORMALLY* enjoy access to is the ability to bung a user’s name and a phone number into the Lync Control Panel and have it tell me where the call’s going to be spat out – assuming it’s not barred of course. Alas, it transpires that when the Control Panel does this it creates a whole stack of new voice routing objects “-inmemory”, and here I run into one of those RBAC walls, as I’m not allowed to do that! 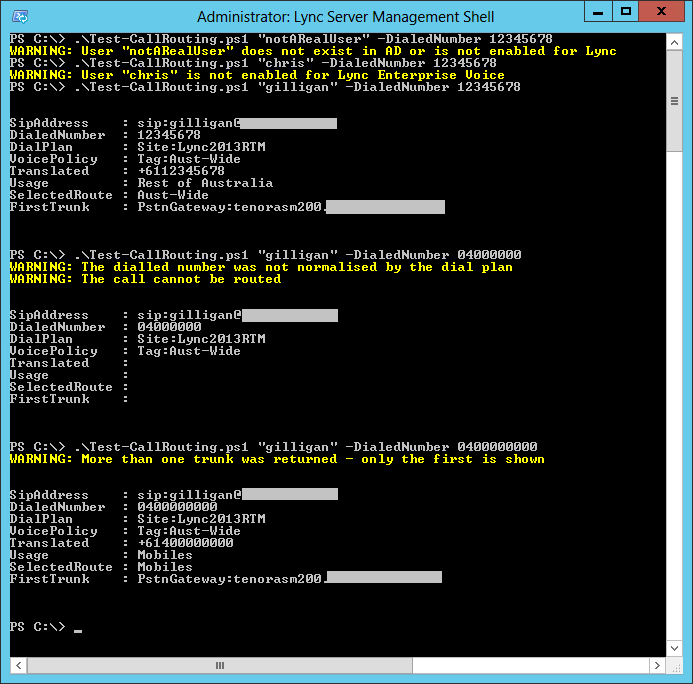 Not to be perturbed, I took to PowerShell and coded my way around it! Here we have “Test-CallRouting.ps1”. (Click on the two images for a larger view). When you’re blocked by RBAC you can click “Run” here all you like – NOTHING’S going to happen – not even a useful “Cannot run the commandlet because it is outside the user’s role-based access control (RBAC) scope”. v1.0 – this is the initial release. The meat of the script is below, or you can Download the whole shebang (with a code-signing certificate) from here. greatest benefit where your restrictions prevent you from using the Control Panel. This script takes a username and dialled number, then retrieves the user's Dial Plan & Voice Policy. only the first is shown. and one of CsHelpDesk or CsVoiceAdministrator. With no command-line parameters you will be prompted for a user name and a dialled number. .\Test-CallRouting.ps1 -Identity "greig@contoso.com" -DialledNumber "049912345678"
gateway that would route the call. A standard Identity name, as you'd provide to the "Get-CsUser" commandlet. A telephone number in the format as dialled by the user. # This first command tests if you have a valid $PS session, and also tests the validity of the user account. $getUser = invoke-expression "get-csuser -identity ""$Identity"" -ea silentlycontinue"
write-warning "The Lync PowerShell module is not loaded, or your session has expired"
write-warning "The detected Lync Server version is 2010. This script requires the Lync 2013 commandlet ""Get-CsEffectivePolicy"""
write-warning "User `"$($Identity)`" does not exist in AD or is not enabled for Lync"
write-warning "User `"$($Identity)`" is not enabled for Lync Enterprise Voice"
write-warning "You have no access to the required Lync 2013 'Get-CsEffectivePolicy' commandlet. (Try CsViewOnlyAdministrator)"
$dialplan = [string](get-csdialplan -identity $dp).identity #This step ensures we get "Site:Lync2013RTM" and not "Site:4"
$voicepolicy = [string](get-csvoicepolicy -identity $vp).identity #This step ensures we get "Site:Lync2013RTM" and not "Site:4"
#Will RBAC let us do this? $callpath = invoke-expression "Test-CsVoiceUser -DialedNumber ""$DialedNumber"" -SipUri ""$sipaddress"" | select MatchingUsage,TranslatedNumber,MatchingRule,FirstMatchingRoute"
write-warning "You have no access to the required 'Test-CsVoiceUser' commandlet. (Try CsHelpDesk or CsVoiceAdministrator)"
write-warning "The dialed number was not normalized by the dial plan"
write-warning "The dialled number was not normalised by the dial plan"
write-warning "The call cannot be routed"
write-warning "More than one trunk was returned - only the first is shown"
Please let me know if you encounter any problems with it, or can suggest improvements or enhancements.